Our paper entitled “Simultaneous Whole-Brain Functional Imaging of Neuronal Activity using Light-Field Microscopy” has been published in Nature Methods. High-speed, large-scale three-dimensional (3D) imaging of neuronal activity poses a major challenge in neuroscience. 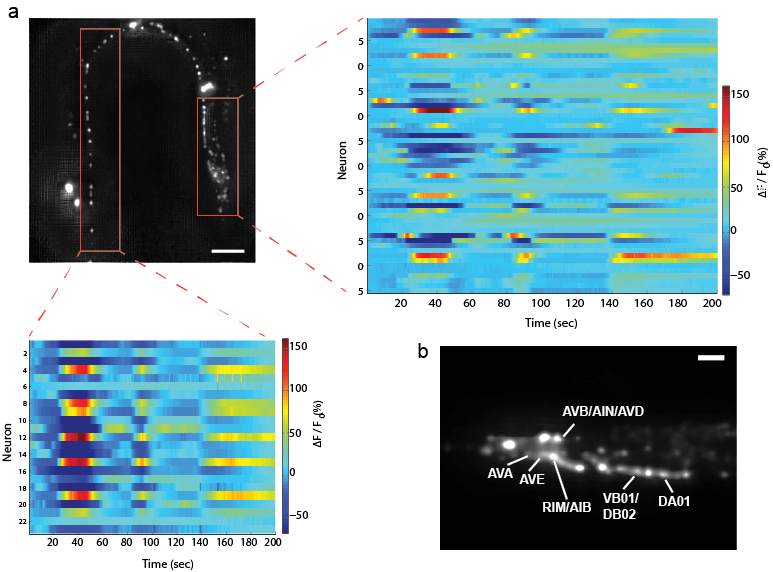 Here we demonstrate simultaneous functional imaging of neuronal activity at single-neuron resolution in an entire Caenorhabditis elegans and in larval zebrafish brain. Our technique captures the dynamics of spiking neurons in volumes of ~700 × 700 × 200 µm at 20 Hz. Its simplicity makes it an attractive tool for high-speed volumetric calcium imaging. Understanding how sensory inputs are dynamically mapped onto the functional activity of neuronal populations and how their processing leads to cognitive functions and behaviour requires tools for non-invasive interrogation of neuronal circuits with high spatiotemporal resolution. However most of the existing tools suffer from low temporal resolution as they rely on scanning in space in one or more dimensions. Figure 1: The LFDM set-up. A microlens array was appended to the camera port of a standard wide-field microscope. 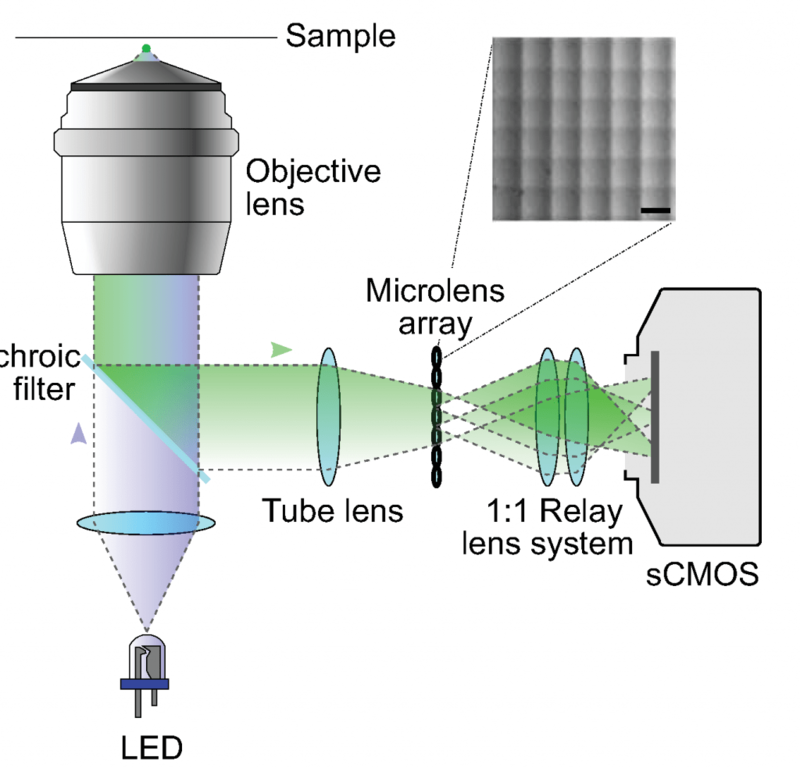 The lens array was placed in the primary image plane of the fluorescence microscope. The array itself was imaged with a 1:1 relay lens system onto the chip of a sCMOS camera. The inset shows a close-up picture of the microlens array. Light-field microscopy (LFM) is an imaging technique that allows capturing 3D information about a sample simultaneously, i.e. without scanning in space. In contrast to conventional imaging schemes, a light-field microscope captures both the 2D location and 2D angle of the incident light. This is done by placing a microlens array in the native image plane such that sensor pixels capture the rays of the light field simultaneously. Such 4D light fields allow the synthesis of a focal stack computationally, making it possible to capture a whole volume with one snapshot. In our recent paper we showed, that LFM combined with deconvolution leads to enhanced spatial resolution making Light-field deconvolution microscopy (LFDM) a versatile tool for high-speed volumetric calcium imaging of entire brains at single neuron resolution. We demonstrate this by applying our technique to functional imaging of entire C. elegans and whole-brains of zebrafish larvae. We used transgenic worms expressing the Ca2+-sensor GCaMP5K in a pan-neuronal and nucleus- bound fashion and custom-designed microfluidic devices to restrain the worms while imaging the worm. Doing so we were able to simultaneously record activity from about 70 neurons located in the head of the worm at the same time with neurons in the ventral cord region sending signals to the mussels. Overall we could capture activity of neurons in a volume of 350 x 350 x 24 µm at 50 Hz volume rate (see video below). The identities of a number of these neurons could be determined using the worm atlas (see figure). Figure 2: (a) Maximum intensity projection of light field deconvolved image of a whole worm: Heat map plots of the neurons contained in red boxes are shown. (b) Head of a worm with labeling of identified neurons. In order to highlight the temporal resolution and the broader applicability of our technique for capturing dynamics of large populations of spiking neurons, we performed Ca2+ imaging in live zebrafish larvae brains expressing the Ca2+ indicator GCaMP5 pan-neuronally. Employing a 20× objective, we demonstrated whole-brain Ca2+ imaging for volumes spanning ~700 × 700 × 200 µm at a 20-Hz volume rate (see video). In this case we could recover spatially resolved cellular signals over the entire time series using standard signal extraction and unmixing techniques. Implementing this approach, we extracted neuronal activity for ~5,000 cells across the brain and followed their fast Ca2+ transients on a millisecond timescale (see Fig. 2). By applying an aversive odor to the fish, we evoked neuronal activity and inferred dynamics of Ca2+ signals across the olfactory system, the midbrain and parts of the hindbrain, results consistent with previous demonstrations of the neuronal dynamics in these regions. The high temporal resolution of the LFDM revealed subtle differences in the exact timing of the onset of the response for different groups of neurons located close to each other (see Fig. 3). Whereas the neurons in each group exhibited a nearly synchronous onset of their activity, the collective response of each group was delayed with respect to those of the other groups. Nature Methods 11, 727–730 (2014).